The Blue Moon Dueling Piano Bar is a place where local talents and national piano acts come to battle it out on the ivory keys. The music ranges from pop ditties to classic rock, and these musicians have what it takes to keep you entertained all night long. Grab a beer and snag a seat, because you're in for a night to remember. When you come to the Blue Moon Dueling Piano Bar, you'll hear experienced pianists take on all genres of music. Request everything from the latest hip hop song to your favorite rock anthem, and the Blue Moon performers will give it a whirl. Audience participation is encouraged, but get your requests in early to make sure you beat the rush. The bar also hosts a trivia night every Tuesday. Take a crash course in arcane facts and head to the bar for seven rounds of trivia. The winners get fun prizes, and every participant gets to have fun. Drink and food specials abound. Blue Moon Dueling Piano Bar is located at the West Glen Town Center is West Des Moines, Iowa. This local shopping destination is chock full of retail stores and exciting eateries. Stop in at the bar after a day full of retail therapy. Live music is even better when accompanied by some tasty food. The Blue Moon Dueling Piano Bar offers a delectable assortment of pub food, from freshly made pizza to savory sandwiches. Order a round of appetizers for your group, or stay healthy with a tasty salad. The bar also has an extensive selection of beers and other drinks. The Blue Moon Dueling Piano Bar is a great location to host your next event. From bachelorette parties to birthday bashes, the bar is one of the best places in town to cut loose. If you decide to hold a party at the bar, the staff helps guide you through the planning process, from the live entertainment to the food selection. 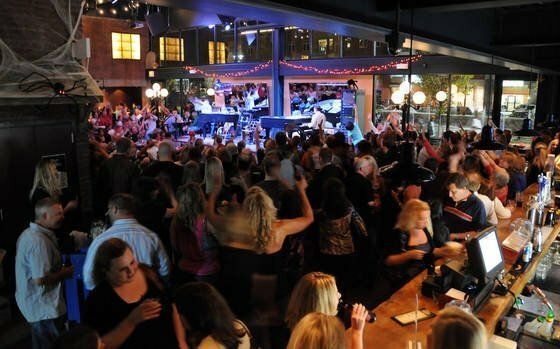 If you're looking for a fun night out in West Des Moines, the Blue Moon Dueling Piano Bar is a great choice. From the boisterous entertainment to the tasty food, this local bar is always full of excitement.